Mr Neotia did his schooling in La Martiniere for Boys, Kolkata and obtained B.Com (Hons.) from St. Xavier's College, Kolkata. Subsequently he completed the Owner President Management Program (OPM) from the Harvard Business School, USA. 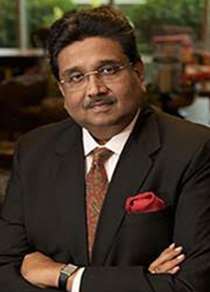 Mr Neotia is the Chairman of Ambuja Neotia Group. Operating through several companies the Ambuja Neotia Group covers the entire spectrum of the Real Estate industry including Housing, Hospitality, Health Care and Education. Mr Neotia was conferred with 'Padma Shri' by the Hon'ble President of India in 1999 for his outstanding initiative in social housing. He was also honoured with YPO Legacy of Honour Award in 2005. Member : Society of Rajiv Gandhi Indian Institute of Management, Shillong. Member : First Court of Tripura University. Member : Chief Minister's Advisory Council, Government of Rajasthan. Member : Chief Minister's Core Committee on Industry, Government of West Bengal. Member : Board of Shree Somnath Trust, Gujarat. Trustee : Indira Gandhi National Centre for the Arts, New Delhi. Honorary Consul of Israel in West Bengal.